Amman runs to UN Security Council over clashes at Judaism's holiest site, claim 'Jewish radicals' cause Muslim rioting. Jordan urged the UN Security Council on Wednesday to end Israeli "escalation" at the Temple Mount after it was opened to Jewish visitors, according to AFP. "Legal, humanitarian and ethical duties of the UN Security Council and the international community require that they stop Israeli escalation and violations committed by Jewish radicals at Al-Aqsa," Information Minister Mohammad Momani told the state-run Petra news agency. "Such actions as well as Israel's insistence on supporting radical groups provoke Muslims around the world, create more instability in the region and violate international laws." The Mount was closed to Jews - but not Arabs - after the rioting, causing outrage from local politicians. 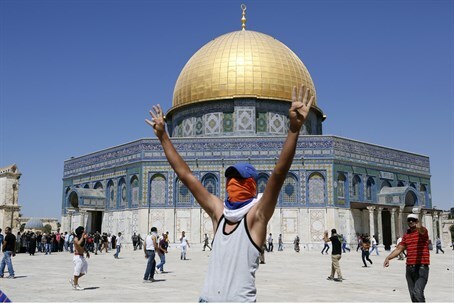 "We need to make order out of the chaos which erupts at the site every holiday," Jerusalem's Deputy Mayor, Dov Kalmanovitz, stated to Arutz Sheva Wednesday. "I already expect Arabs to throw stones tomorrow at the Western Wall. We should teach the Arabs a lesson for once and close it for them [too]." Jordan recently threatened to revoke its 1994 peace treaty with Israel over a historic debate in the Knesset about providing full religious freedom at Judaism's holiest site. Under the peace treaty, Jordan controls Muslim holy sites in Jerusalem. The Temple Mount falls under this category, despite being Judaism's holiest site and the site of the two Jewish Temples, and the Muslim world has been adamant about keeping it in Muslim hands.